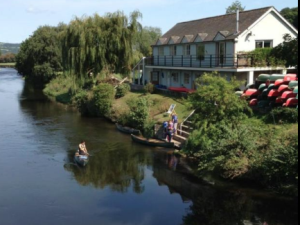 Kayaking at Wye Valley Canoes KayakingWe have Canadian canoes, single and double kayaks. It is always best to book and reserve boats as we get very booked up in the summer months. You can either paddle down in your own group (minimum group size of 2!) or we can organise a guide or an instructor to take you down the river.